You can use this topic to learn about DNS Policy, which is new in Windows Server 2016. You can use DNS Policy for Geo-Location based traffic management, intelligent DNS responses based on the time of day, to manage a single DNS server configured for split-brain deployment, applying filters on DNS queries, and more. The following items provide more detail about these capabilities. Application Load Balancing. When you have deployed multiple instances of an application at different locations, you can use DNS policy to balance the traffic load between the different application instances, dynamically allocating the traffic load for the application. Geo-Location Based Traffic Management. You can use DNS Policy to allow primary and secondary DNS servers to respond to DNS client queries based on the geographical location of both the client and the resource to which the client is attempting to connect, providing the client with the IP address of the closest resource. Split Brain DNS. With split-brain DNS, DNS records are split into different Zone Scopes on the same DNS server, and DNS clients receive a response based on whether the clients are internal or external clients. You can configure split-brain DNS for Active Directory integrated zones or for zones on standalone DNS servers. Filtering. You can configure DNS policy to create query filters that are based on criteria that you supply. Query filters in DNS policy allow you to configure the DNS server to respond in a custom manner based on the DNS query and DNS client that sends the DNS query. Forensics. You can use DNS policy to redirect malicious DNS clients to a non-existent IP address instead of directing them to the computer they are trying to reach. Time of day based redirection. You can use DNS policy to distribute application traffic across different geographically distributed instances of an application by using DNS policies that are based on the time of day. DNS Policies are divided by level and type. You can use Query Resolution Policies to define how queries are processed, and Zone Transfer Policies to define how zone transfers occur. 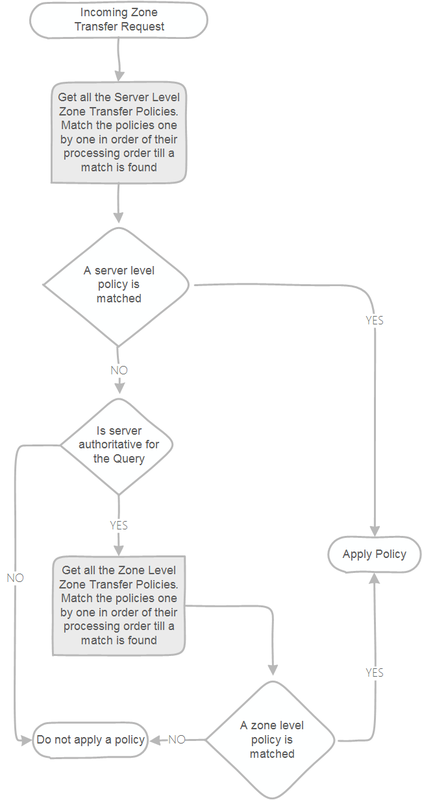 You can apply Each policy type at the server level or the zone level. Server level policies can only have the values Deny or Ignore as an action. Recursion policies are a special type of server level policies. Recursion policies control how the DNS server performs recursion for a query. Recursion policies apply only when query processing reaches the recursion path. You can choose a value of DENY or IGNORE for recursion for a set of queries. Alternatively, you can choose a set of forwarders for a set of queries. You can use recursion policies to implement a Split-brain DNS configuration. In this configuration, the DNS server performs recursion for a set of clients for a query, while the DNS server does not perform recursion for other clients for that query. Apply on recursion Specifies that this policy should only be used for recursion. Recursion Scope Name of the recursion scope. Recursion policies can only be created at the server level. Zone transfer policies control whether a zone transfer is allowed or not by your DNS server. 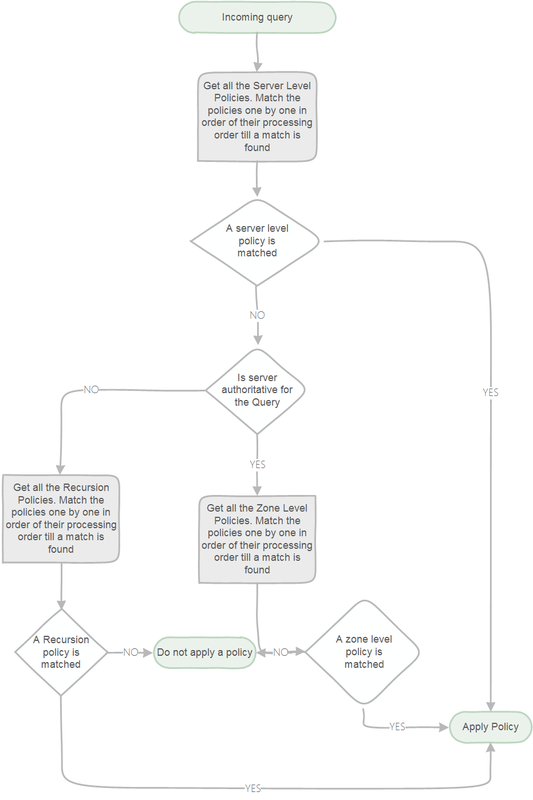 You can create policies for zone transfer at either the server level or the zone level. Server level policies apply on every zone transfer query that occurs on the DNS server. Zone level policies apply only on the queries on a zone hosted on the DNS server. The most common use for zone level policies is to implement blocked or safe lists. Zone transfer policies can only use DENY or IGNORE as actions. Add-DnsServerZoneTransferPolicy -Name DenyTransferOfContosoToFabrikam -Zone contoso.com -Action DENY -ClientSubnet "EQ,192.168.1.0/24"
You can direct traffic based on an FQDN to different servers depending on the location of the DNS client. The example below shows how to create traffic management policies to direct the customers from a certain subnet to a North American datacenter and from another subnet to a European datacenter. Add-DnsServerClientSubnet -Name "NorthAmericaSubnet" -IPv4Subnet "172.21.33.0/24"
Add-DnsServerClientSubnet -Name "EuropeSubnet" -IPv4Subnet "172.17.44.0/24"
Add-DnsServerZoneScope -ZoneName "Contoso.com" -Name "NorthAmericaZoneScope"
Add-DnsServerZoneScope -ZoneName "Contoso.com" -Name "EuropeZoneScope"
Add-DnsServerResourceRecord -ZoneName "Contoso.com" -A -Name "www" -IPv4Address "172.17.97.97" -ZoneScope "EuropeZoneScope"
Add-DnsServerResourceRecord -ZoneName "Contoso.com" -A -Name "www" -IPv4Address "172.21.21.21" -ZoneScope "NorthAmericaZoneScope"
Add-DnsServerQueryResolutionPolicy -Name "NorthAmericaPolicy" -Action ALLOW -ClientSubnet "eq,NorthAmericaSubnet" -ZoneScope "NorthAmericaZoneScope,1" -ZoneName "Contoso.com"
The first two lines of the script create client subnet objects for North America and Europe. The two lines after that create a zone scope within the contoso.com domain, one for each region. The two lines after that create a record in each zone that associates ww.contoso.com to different IP address, one for Europe, another one for North America. Finally, the last lines of the script create two DNS Query Resolution Policies, one to be applied to the North America subnet, another to the Europe subnet. Add-DnsServerQueryResolutionPolicy -Name "BlackholePolicy" -Action IGNORE -FQDN "EQ,*.treyresearch.com"
Add-DnsServerQueryResolutionPolicy -Name "BlackholePolicyMalicious06" -Action IGNORE -ClientSubnet  "EQ,MaliciousSubnet06"
You can control recursion by using a DNS Query Resolution Policy. The sample below can be used to enable recursion for internal clients, while disabling it for external clients in a split brain scenario. Add-DnsServerQueryResolutionPolicy -Name "SplitBrainPolicy" -Action ALLOW -ApplyOnRecursion -RecursionScope "InternalClients" -ServerInterfaceIP  "EQ,10.0.0.34"
The first line in the script changes the default recursion scope, simply named as "." (dot) to disable recursion. The second line creates a recursion scope named InternalClients with recursion enabled. And the third line creates a policy to apply the newly create recursion scope to any queries coming in through a server interface that has 10.0.0.34 as an IP address. Add-DnsServerZoneTransferPolicy -Name "NorthAmericaPolicy" -Action IGNORE -ClientSubnet "ne,AllowedSubnet"
The first line in the script creates a subnet object named AllowedSubnet with the IP block 172.21.33.0/24. The second line creates a zone transfer policy to allow zone transfers to any DNS server on the subnet previously created. Add-DnsServerZoneTransferPolicy -Name "InternalTransfers" -Action IGNORE -ServerInterfaceIP "ne,10.0.0.33" -PassThru -ZoneName "contoso.com"
For information on how to use DNS policy for specific scenarios, see the following topics in this guide. DNS Policy is compatible with Read-Only Domain Controllers. Do note that a restart of the DNS Server service is required for new DNS Policies to be loaded on Read-Only Domain Controllers. This is not necessary on writable domain controllers.